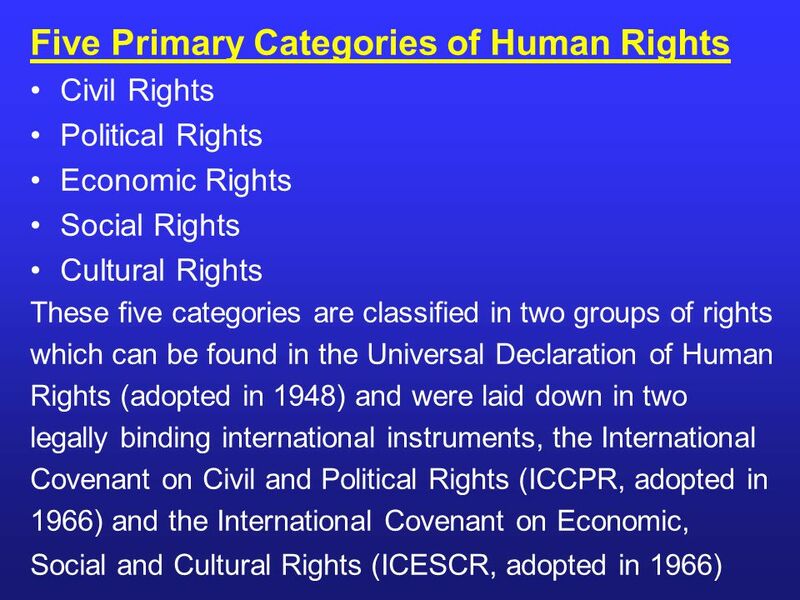 Civil and political rights comprise the first portion of the Universal Declaration Of Human Rights almost more than half of the articles address civil and political rights. 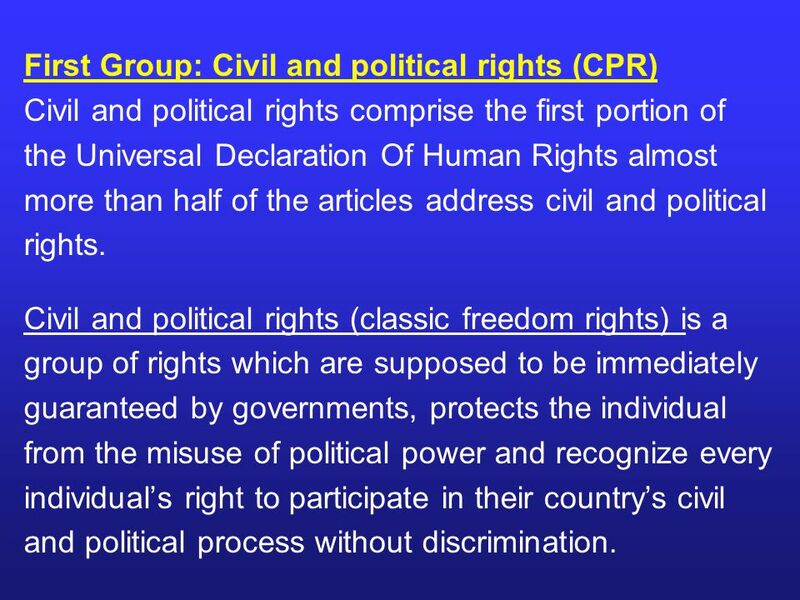 Civil and political rights (classic freedom rights) is a group of rights which are supposed to be immediately guaranteed by governments, protects the individual from the misuse of political power and recognize every individual’s right to participate in their country’s civil and political process without discrimination. 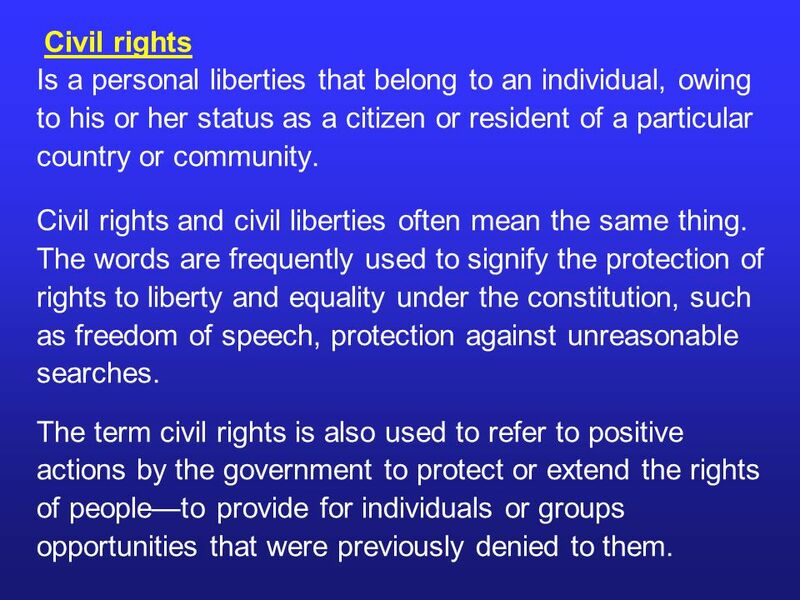 Civil rights Is a personal liberties that belong to an individual, owing to his or her status as a citizen or resident of a particular country or community. Civil rights and civil liberties often mean the same thing. The words are frequently used to signify the protection of rights to liberty and equality under the constitution, such as freedom of speech, protection against unreasonable searches. The term civil rights is also used to refer to positive actions by the government to protect or extend the rights of people—to provide for individuals or groups opportunities that were previously denied to them. 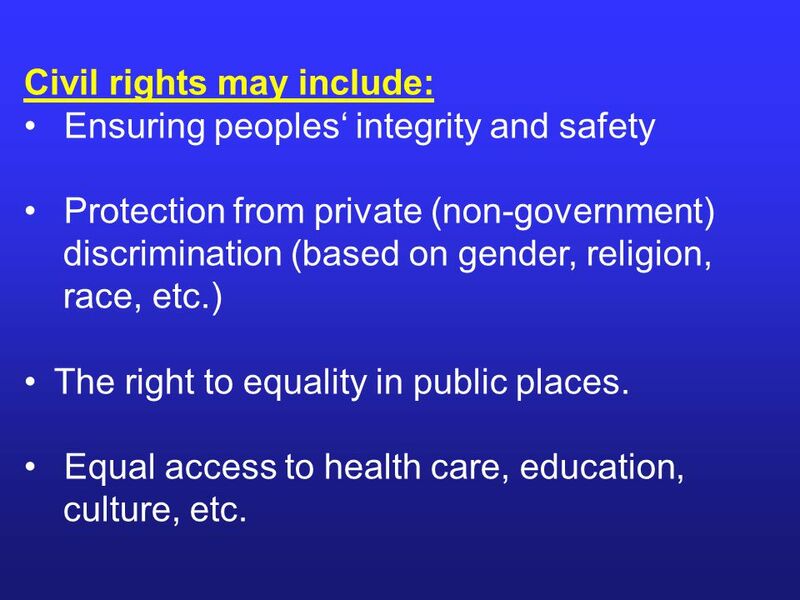 Ensuring peoples‘ integrity and safety Protection from private (non-government) discrimination (based on gender, religion, race, etc.) The right to equality in public places. Equal access to health care, education, culture, etc. 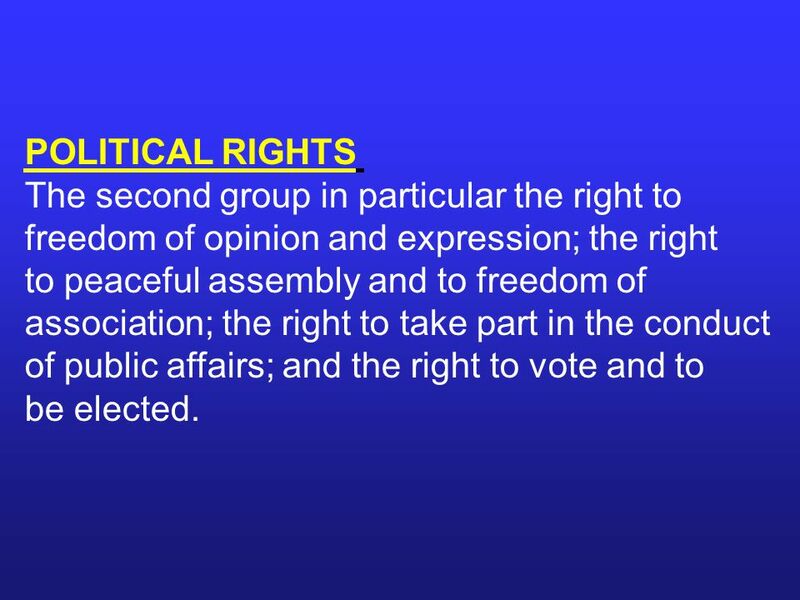 7 POLITICAL RIGHTS The second group in particular the right to freedom of opinion and expression; the right to peaceful assembly and to freedom of association; the right to take part in the conduct of public affairs; and the right to vote and to be elected. 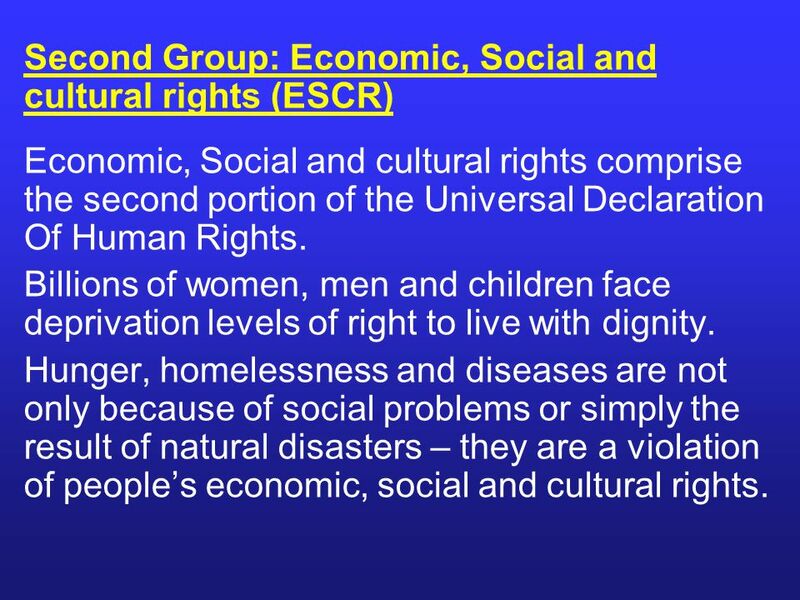 Economic, Social and cultural rights comprise the second portion of the Universal Declaration Of Human Rights. Billions of women, men and children face deprivation levels of right to live with dignity. Hunger, homelessness and diseases are not only because of social problems or simply the result of natural disasters – they are a violation of people’s economic, social and cultural rights. 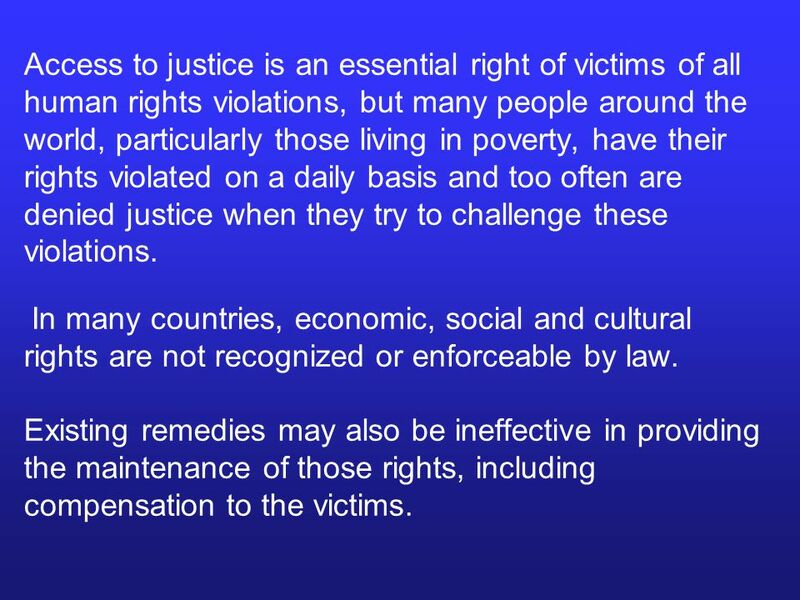 human rights violations, but many people around the world, particularly those living in poverty, have their rights violated on a daily basis and too often are denied justice when they try to challenge these violations. 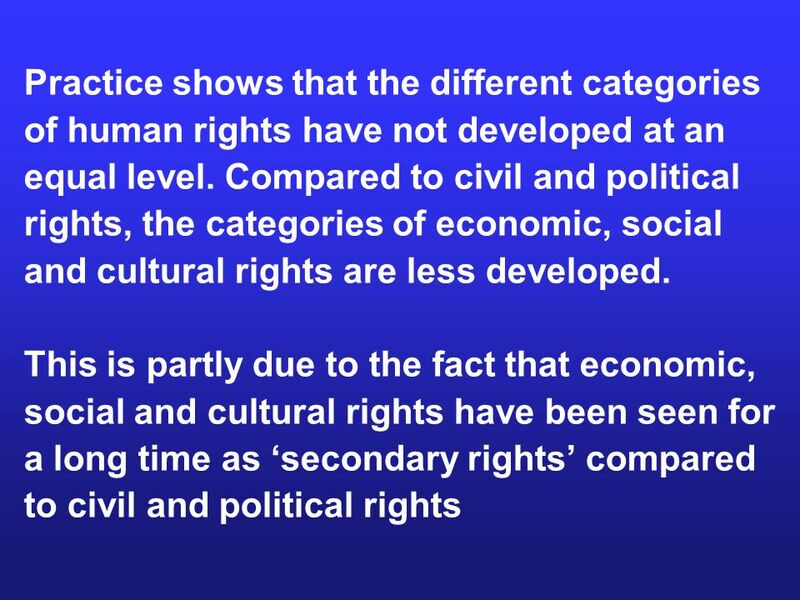 In many countries, economic, social and cultural rights are not recognized or enforceable by law. Existing remedies may also be ineffective in providing the maintenance of those rights, including compensation to the victims. 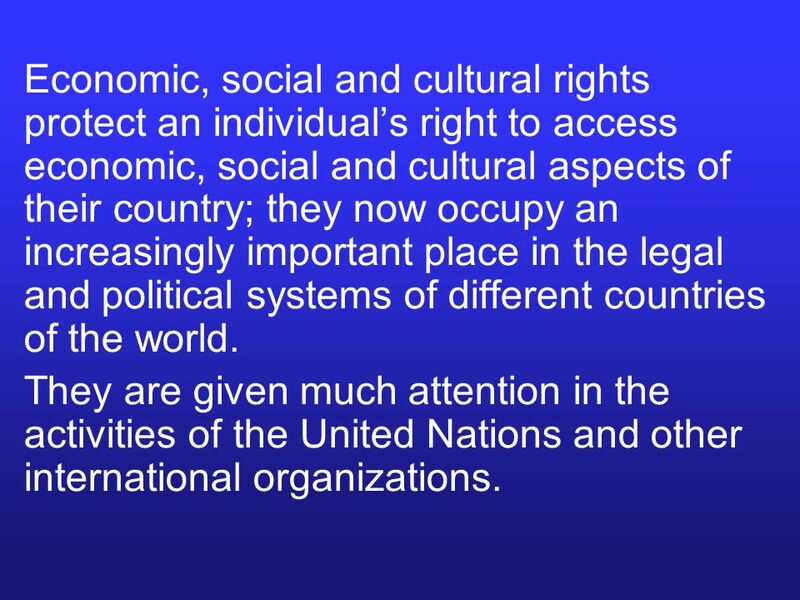 11 Economic, social and cultural rights protect an individual’s right to access economic, social and cultural aspects of their country; they now occupy an increasingly important place in the legal and political systems of different countries of the world. They are given much attention in the activities of the United Nations and other international organizations. 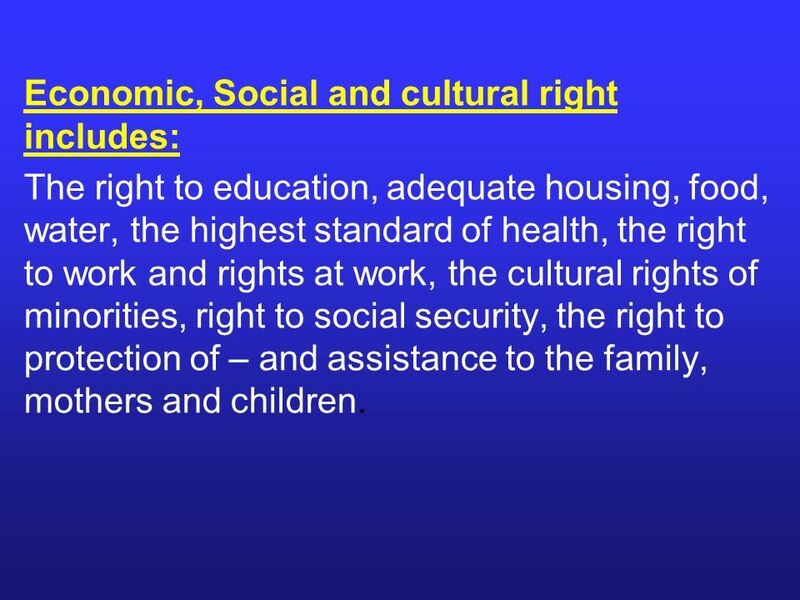 The right to education, adequate housing, food, water, the highest standard of health, the right to work and rights at work, the cultural rights of minorities, right to social security, the right to protection of – and assistance to the family, mothers and children. 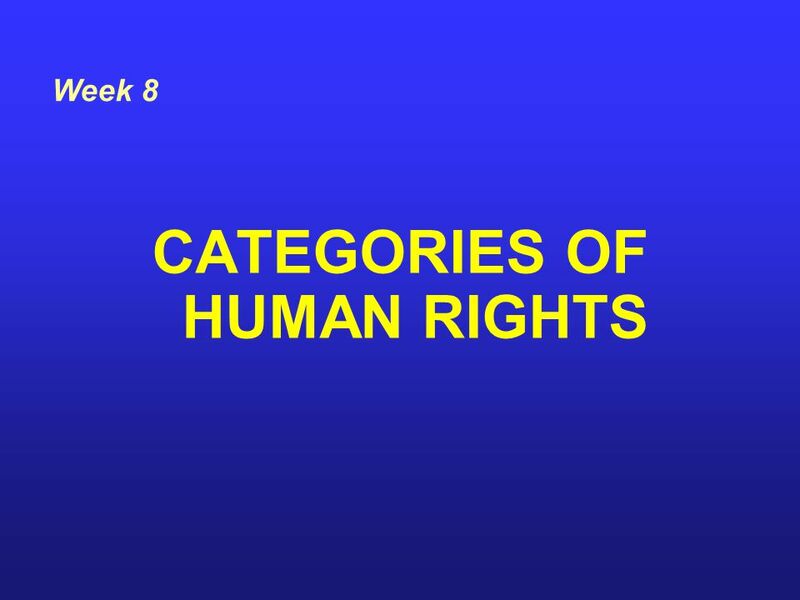 Download ppt "CATEGORIES OF HUMAN RIGHTS"
The Right to Enjoy the Benefits of Scientific Progress State Obligations Yvonne Donders Amsterdam Center for International Law. A Human Rights Approach to the Benefits of Scientific Progress Audrey R. Chapman, Ph.D. University of Connecticut School of Medicine July 26, 2010 AAAS. Street Law Chapter 1 What is Law. HUMAN RIGHTS Right of everyone to the enjoyment of the highest attainable standard of physical and mental health Heather Payne-Drakes. Human Rights What are they?. 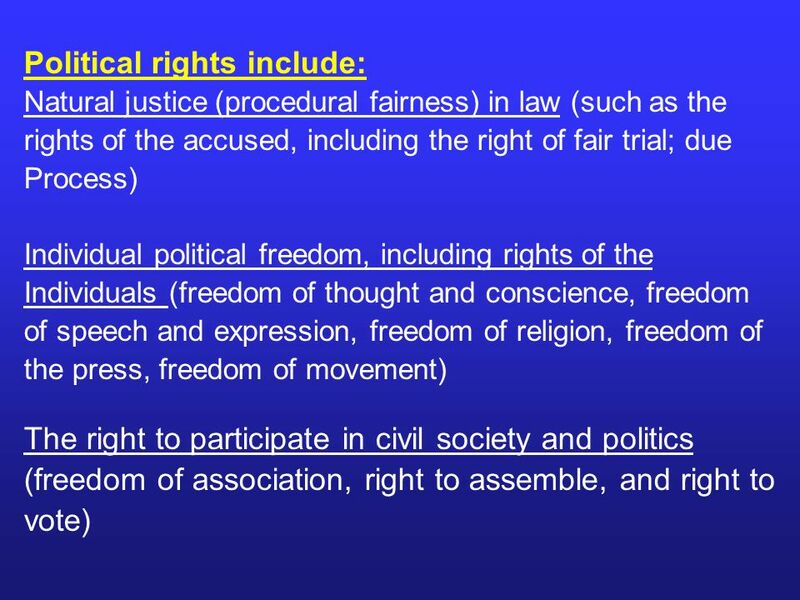  Fundamental Rights for Pakistanis are aimed at overturning the inequities of past social practices.  Guarantee that all citizens can and will lead. SESSION TWO Human rights and responsibilities and international refugee law.  Addressed by the Declaration of Independence (“All men are created equal”) and by the 14 th Amendment (citizenship and equal protection of the laws).